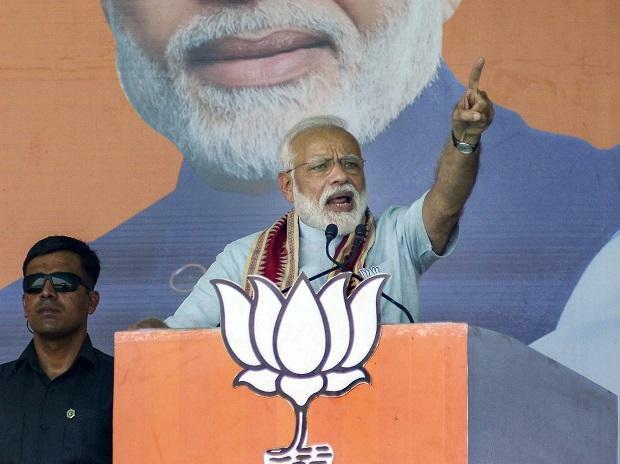 Making a pitch for a "strong government" at the Centre, Prime Minister Narendra Modi on Saturday said the BJP was contesting the Lok Sabha elections to punish "terrorists and separatists for their sins", but the Congress wanted to give them a free rein. Addressing a poll rally at Hathuad in Balod district of Chhattisgarh, Modi hit out at Congress Chief Rahul Gandhi, saying the "naamdar" (dynast) has had to "run away" to find a safe seat. "Congress and its allies are contesting the polls for looting the hard-earned money of people while we are contesting it to use every paisa judiciously. "Congress and its allies are contesting elections for giving a free hand to terrorists and separatists, while we are contesting it to punish terrorists and separatists for their sins," Modi added. "Congress and its allies are contesting the election to weaken the armed forces, while the BJP is fighting to make the armed forces self-reliant," he said. "In the last five years, you have seen what is meant by a strong government. When the government is strong, the county does not sit quiet after a terrorist attack. It retaliates strongly," he said. Calling the Armed Forces (Special Powers) Act a "Suraksha Kavach" (armour)) of the security forces, he slammed the Congress for "promising to repeal it in its dhakosla patra (sham manifesto)". Referring to airstrike at terror camp in Balakot, Modi said "Didn't you feel proud when the country punished perpetrators of terror....When there is a strong government, there is surgical strike and air strike and the world listens to us." Whereas when the government is weak, "the world puts pressure on it", he added. "Do you want a government of 'chowkidar' (watchman) or a procession of corrupt (bhrashtachariyon ki baraat)," he asked the gathering. Under the BJP rule, successful attempt was made to end the Naxal menace in Chhattisgarh, the prime minister said. Referring to a Maoist attack on April 4 in which four BSF men were killed, he said, "Lakhs of our soldiers are engaged in making Chhattisgarh free from the clutches of guns and bombs. Recently our jawans were martyred in Kanker. Congress does not care for sacrifices of soldiers." Without naming Rahul Gandhi, he said, "The naamdar, who used to think of his constituency (Amethi) as part of his bequest, is now running for a safe seat. "You can imagine how much disappointment is there that just when Lok Sabha election (campaign) is gaining momentum, you (Gandhi) are running away from the election field." The Congress president is contesting the election from Uttar Pradesh's Amethi and Wayanad in Kerala. "This situation has arisen because Congress' intentions are not good. They did not even hesitate to take bribe in a helicopter deal," he said, in apparent reference to the AugustaWestland case. "Congress' 'Naamdar' family is out on bail", he added. Modi also alleged that the Congress did not keep its promises to farmers and the youths of Chhattisgarh including that of loan waiver after coming to power. Balod district falls in the Naxal-hit Kanker constituency, which will go to the polls on April 18.